Son to Johnny Henderson, who notably founded the Racecourse Holdings Trust, Nicky Henderson established himself as one of the best British racehorse trainers through his success in training an incredible sixty winning horses at Cheltenham Festival. His career in horse racing started by working as an amateur jockey before becoming Assistant Trainer to Fred Winter - a man known for dominating the sport for thirty years between 1950 and 1980. As Nicky Henderson’s father was so highly regarded in horse racing, a race at Cheltenham Festival was renamed as The Johnny Henderson Grand Annual Chase in his honour two years after his death. Nicky Henderson went on to win the race a year later with Greenhope, proving his ability to live up to the standard set by his father. With over 150 horses currently in training, there are plenty of Nicky Henderson horses to follow as they take on some of the UK and Ireland’s most prestigious race meetings. Henderson moved his stables to Seven Barrows in 1992, where it’s become a hive for producing an extensive list of winning horses. A primary winning horse from Seven Barrows stables is See You Then, which won the Cheltenham Festival Champion Hurdle in three successive attempts between 1985 and 1987. Experienced fans of horse racing will regard Nicky Henderson for his ability to get the most out of horses in jump races, with Sprinter Sacre being especially impressive through twelve race wins in six years including two wins in the Queen Mother Champion Chase. The two horses which Nicky Henderson racing are primarily known for are Buveur d’Air and Altior. These nags worked their way into being two of the most-backed favourites for some of the year’s biggest race meetings. Altior picked up a record of fifteen wins from seven runs, where it won the Sharp Novices’ Hurdle, the Supreme Novices’ Hurdle, the Henry VIII Novices’ Chase, the Arkle Challenge Trophy, the Queen Mother Champion Chase, and both the Game Spirit Chase and the Celebration Chase on two occasions. Meanwhile, Buveur d’Air has been equally as unbeatable, picking up a record of fourteen wins and a place from seventeen runs, and sealing victories in the Top Novices’ Hurdle, the Aintree Hurdle, the Fighting Fifth Hurdle, the Christmas Hurdle, as well as successive wins in the Contenders Hurdle and the Champion Hurdle. Most Nicky Henderson horses in training capitalise primarily at Aintree Racecourse, with three winners and five second place finishes in the 2017 Aintree Festival alone, making it a frightening prospect to have a horse racing at Aintree that’s coming up against one of the nags trained at Seven Barrows. He was also crowned as Aintree Champion trainer in 2014 with four winners, 2013 with five winners and 2012 with six winners. There was some controversy in 2009, where a failed drugs test breached the horse racing rules. 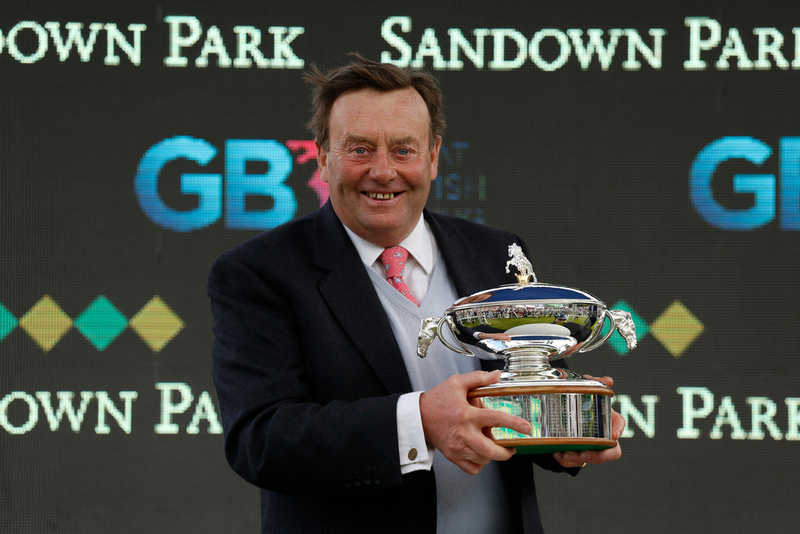 Nicky Henderson was able to maintain his reputation by admitting his fault and accepting the fine given to him by the British Horseracing Authority, where he said that it was something he did for the horse’s welfare and not to bend any rules. He was still allowed to train horses during the three-month ban from horse racing and returned in 2011 by claiming his second win at Royal Ascot, where Veiled finished first in the 2011 Ascot Stakes. Situated at Seven Barrows in Berkshire, the Nicky Henderson stables are some of the best in the UK. Following on from consistency as a winning jockey, Mick Fitzgerald was the main jockey at the Nicky Henderson stables until he suffered a career-ending injury riding L’Ami at the 2008 Grand National. During his time working within the Nicky Henderson racing team, Fitzgerald won the 1996 Grand National with Rough Quest, the 1999 Cheltenham Gold Cup with See More, and was the leading jockey at Cheltenham Festival for both 1999 and 2000. Although he came back from an injury to win the 2005 Hennessy Gold Cup with Trabolgan, Mick Fitzgerald’s spinal injury at the 2008 Grand National was enough to finish his time as a professional jockey. This led to Barry Geraghty becoming the main jockey at Nicky Henderson stables on an interim period before Nico de Boinville took the job at the start of the 2015/16 season, where he’s since shown his ability with four wins on Altior and four wins on Might Bite. Nicky Henderson's stables look after some of the best jump horse's in the UK. Click on the below horse's name for more insight into this highly successful horse trainer's horses.